Have you heard the saying, bigger is better? Well, that’s not always true but for screen size, it often is, especially when you’re viewing pictures, videos, or other media. Don’t get me wrong, resolutions on phones are getting better and better (and the phones are getting bigger as well), but sometimes, bringing up a picture and then spending a minute and a half on make the zoom gesture with your fingers is annoying every time you just want to show somebody at your table a picture you had taken earlier. Or whenever you want to look at some pictures that your friends have posted to their Instagram accounts. That is why I’ve created this guide, teaching you several ways to get Instagram for iPad. After this article, you will be fully equipped to view and post on the Instagram app no matter what iOS device you’re on. You will find detailed information on how to download the app, viewing photos online, alternatives, and a few tricks to enhance the overall experience. Per usual, this is an ever-evolving subject and one that I will try to keep up to date on this article. After all, given the popularity of Instagram, the development team is always tweaking the app and the site to improve the experience, so all of us dedicated Instagram users want to make sure we’re staying on top of these things. You’ve likely landed on this page because you realized that there was no official Instagram app that was truly built for the resolution and screen size of the iPad. This leaves a lot of people in a perplexing situation where they are required to compromise and find alternative solutions. The official reason Instagram (owned by Facebook) gave on why they haven’t created an Instagram app for iPad is that they are focusing primarily on the mobile iPhone and Android systems to build their audience. It is not uncommon that in this day and age there are many options for people to present their content. Some apps or products decide to go with the shotgun approach where they make their app compatible with everything and some decide to stick to a few options but really focus on refining those few options. Obviously, Instagram is the latter. I would not be surprised if in the next few years we see a stand-alone, dedicated app that Instagram has built for tablets, but I doubt it will be in the very near future. If you consider the photo and video storage requirements for duplicating all the content of Instagram in a resolution compatible for the iPad, you can get a grasp of how much effort and cost this truly requires. Never mind the added teams required for coding, quality assurance, or customer service, or managing security for people who lock themselves out of their accounts. It would be a major undertaker for any developer, but when you consider the volume of users that Instagram deals within its loyal fanbase, it quickly becomes a nightmarish undertaking. Now, let’s get into the real reason you came to this site and dive into what your real options are today. The first option is a good workaround and will give you an 80% solution to the problem. Basically, what I’ll show you how to do is to download the iPhone version of Instagram onto your iPad. This is a trick that actually works for a majority of iPhone apps that do not have iPad counterparts, though of course performance will never quite match a dedicated iPad app. This, of course, comes with a few issues that you may or may not be aware of. The primary issue is that the resolution is built for the iPhone and therefore will be at a lower resolution than your iPad. This has gotten better with the release of the bigger iPhone 6 Plus and therefore decreasing the screen size gap between the two. Nonetheless, better resolution is the entire reason you want an iPad app, so this can be a bit of an annoyance for people who just want to be able to put their phones down once in a while but still want to be able to see what all of their friends are up to. You can get around this resolution issue by simply downloading the app and tapping the “2x” at the bottom right when you open the app. This won’t increase the resolution but will increase the size by a factor of 2. Therefore, it will be larger but more pixelated. Open the App Store on your iPad and you can take one of two routes to get Instagram installed. The first and easiest option is to tap the “purchased” icon at the bottom of the app store and when you see the screen of all of your purchased apps, simply tap the “iPad Apps” icon at the top right and choose iPhone apps. Then scroll down until you find Instagram and tap the download button. Note, this trick only works if you already have Instagram on another iPhone and therefore it’s in your purchased list. The other option is to download Instagram from scratch. Tap on the Featured tab at the bottom left. Remember to do this as I’ve had issues searching from other tabs for some reason. After you’re on the Featured tab, search for Instagram and you will notice the original app doesn’t show up. Tap where it says iPad Only at the top right and choose iPhone Only instead. Voila. The official Instagram app (produced by “Instagram, Inc.”) now appears. This trick works for a lot of apps. Now, you will see Instagram pop up and you will have the option to download it. Note: There are a few third-party apps which will interface with your Instagram account. Note the developers listed. The proper Instagram app should be by “Instagram, Inc.” I haven’t worked with all of these third-party apps (a new one seems to come up every day), so I can’t speak for all of them, but it comes down to trust: are you going to trust some group you’ve never heard of to have access to your social media accounts (since, if you’re like me, most of your accounts are linked one way or the other). Also, Instagram has all the power of Facebook behind it, which comes with a pretty good monetizing structure. These third-party apps usually have to pay for themselves with obtrusive and annoying ads. The next option is my favorite as there is no workaround and it natively works on any screen size no matter what device you’re on. This option is to log in to Instagram online using your iPad and from there you can not worry about downloading the app at all. However, there are a few downsides to this option as well that may make you want to choose to go with the app version. The biggest downside is that you cannot take photos and upload them using the online version. You may already access Instagram online using your Mac or PC and will note that you can only view, like, and comment on photos but you can’t post anything online. This limits how you can use Instagram on iPad if you go with the online version. If you don’t mind not being able to upload a photo, then I think this is the best option. You can always pick up your iPhone or Android if you actually want to take a photo and upload it. Open your iPad browser and type in instagram.com in the address bar. This will take you to the main page that will look just like the screenshot below. Tap on the Login button and enter in your username and password. If you forgot your password you can tap the “forgot password” link and it will tell you how to recover it. That’s all you need to do, after you log in you will have full access to your Instagram feed. TIP: You can tap where it says Download on the App Store and it will bring up Instagram in the app store to download directly just like the first option. 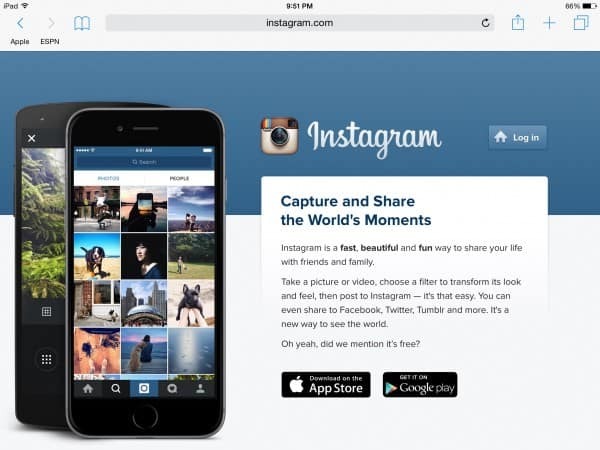 Lastly, we will cover your various options when it comes to Instagram alternatives for iPad. Take note that none of the options below will actually allow you to upload a photo or video to your feed. You will only be able to view photos, like, comment, or share photos with your friends. This is all in addition to the concerns that I listed above in my first point. The main reason is that Instagram wants to limit where and how you can actively interact with its platform. By actively, I mean adding content to the overall platform, versus passively where you’re simply taking in information but not adding information beyond likes and comments. There are several good options out there that all have pros and cons, therefore, I’ll provide my perspective on the top apps and you can decide which one makes your list of favorites. Padgram is a good option that is absolutely free and will allow you to view your Instagram feed. One of the best features of Padgram is the ability to browse when you’re in landscape mode and not only in portrait mode. You have a variety of options and features when using this app. You can view all of your photos on a map where they are geotagged. That means whenever you take a photo or someone else shares their location, you will notice exactly where the photo was taken on the map. This is cool if you just want to see images from a certain city or place. You also have the option to share a photo on a ton of different services, from Facebook to Twitter to Pinterest to Tumblr. I would say the main downside is that there isn’t a built-in, easy to use swipe feature that seems intuitive when you use the app. This would be the only major change I would recommend. The other option I would recommend checking out is Pictacular, another free iPad app that allows you to view your Instagram feed. The same applies as above that you cannot upload your own photos using this app but you can only view them. The best part of this app is the layout, look, and feel of it. It’s very easy to use and makes Instagram photos easy to view and scroll through. You will need to sign in using your Instagram username and password and then you will see all of the photos in an array similar to Pinterest. You have the ability to tap a photo to enlarge it and then swipe left or right to scroll through the images. You will notice that there are three columns and you can view all of the comments right there without having to tap anything else to view them. Unfortunately, it appears that there is no way to comment on a photo, you can only like a photo at this time and comments are limited to the most recent 3. Therefore, if you want to see all the comments you will have to use another option. Another downside I’ve noticed is that there is no map version so if that is a feature you use often you will likely want to choose Padgram as your app of choice. Similar to the other app, you have the option to share photos on Facebook, Twitter, and Pinterest so that your friends can view the photos as well. The last thing I will leave you with is the option to email Instagram customer support and request that they make a stand-alone iPad app version. If Facebook / Instagram keeps getting thousands of requests that they make an iPad app then eventually they will realize the value in creating it. They will never know how much we would appreciate and use an Instagram for iPad app unless we tell them directly. I hope this article has been helpful in laying out your options and has provided you with enough details to get Instagram up and running on your iPad. Leave a comment if you know of any other cool tips or tricks that our readers can use. We try to keep these articles fairly up to date, so maybe your comment will be incorporated to a future edit of this article. As always, we appreciate if you would share this post with your friends.